I mention this experience and this lesson because right now our movement is being called from the frontlines of climate change via a man named Yeb Sano. Yeb Sano is the lead negotiator for the Philippines at the UN Climate Talks happening right now in Warsaw. Last week Sano made a speech to the conference as Typhoon Haiyan was ravaging his country. In this moment Sano did not break down with despair but he decided to fight and send a clear message to all nations at the UN talks saying “in solidarity with my countrymen who are struggling to find food back home and with my brother who has not had food for the last three days, in all due respect Mr. President and I mean no disrespect for your kind hospitality, I will now commence a voluntary fasting for the climate. This means I will voluntarily refrain from eating food during this conference until a meaningful outcome is in sight”. We have got to a point in history where a lead negotiator from a nation being severely impacted by climate change is going on hunger strike to be heard. Now is the time for our new Prime Minister Tony Abbott to follow the leadership of Yeb Sano and act strongly on climate change, not go backwards. Sano’s brave action not only sends a message to our government but to us as a climate movement in a nation which has the opportunity to be powered by the wind and the sun but is instead looking to rapidly expand its coal and gas. While announcing his hunger strike Sano said, “These last two days, there are moments when I feel that I should rally behind the climate advocates who peacefully confront those historically responsible for the current state of our climate. These selfless people who fight coal, expose themselves to freezing temperatures, or block oil pipelines”. Sano is calling us as a movement to support people like Jonathan Moylan, a young man facing 10 years in jail for sending a fake press release to expose ANZ’s investment in the Maules Creek coal mine planned in New South Wales. Sano is calling us as a movement to go deeper and that can start today. You, alongside thousands of others across the country have come out today to call on our government to invest in solutions – not more pollution – and to take strong, meaningful action on climate change. You could not be in a more important place than here at this moment in history. We are at a critical junction and we face a stark choice: are we going to invest in building an Australia powered by 100% renewable energy or are we going to allow business as usual to continue with our future being the cost. In South Australia we are perfectly placed to start Australia down the right path by investing in solar thermal in Port Augusta, creating a new manufacturing industry, new clean energy jobs and clean air for a town which has double the rate of lung cancer compared to the rest of the state. With leadership from our state and federal governments solar thermal could be a reality in Port Augusta, but without us, everyday people raising our voices throughout this coming summer and beyond it won’t happen. That is why I want to ask you all to go and visit the campaign stalls at the end of the rally and get involved. For some of you coming along today is your first involvement with the movement and there are other people who have been involved for a whole lot longer than me. But none of that matters now, what matters is that today we decide as a movement that, throughout this summer and everyday until we win, we will act collectively for a safe climate future, act in solidarity with Yeb Sano and act in solidarity with the people of the Philippines and all communities being impacted by climate change. If you’re in raise your hand. 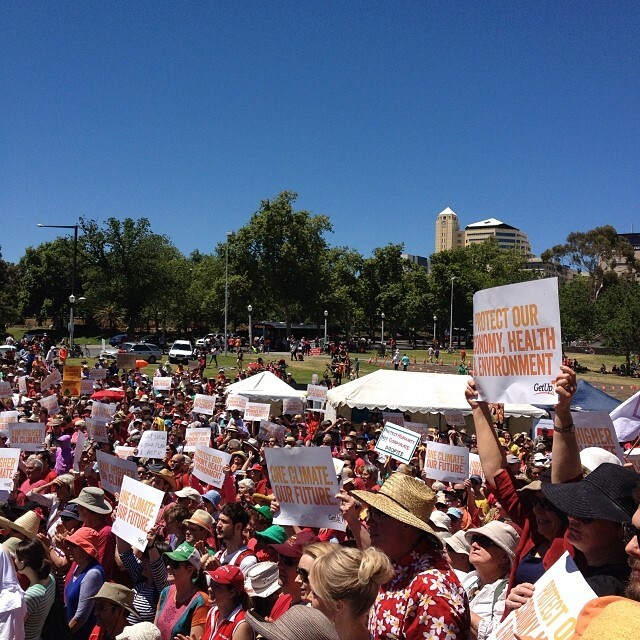 This is the text of a speech delivered at the Adelaide #ClimateAction rally on Nov 17th 2013. More photos are on the New Internationalist Tumblr site. 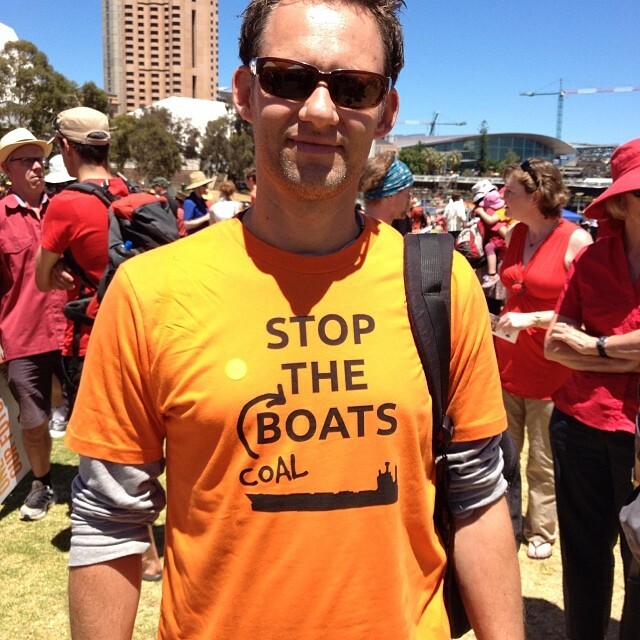 This entry was posted in Climate change, Renewable Energy, Uncategorized and tagged #ClimateAction, 350.org, activism, AYCC, climate change, Dan Spencer, Port Augusta Solar Thermal, renewable energy, solar power by Dan Spencer. Bookmark the permalink.